Does Your Greenlawn home's roof leak? Or are you simply not happy with the look or layout of your bathroom? Whatever you don't like about your home, one thing's for sure: You can get rid of that headache by calling Greelawn's experienced contractors at Magnum Contracting Group for our repair and remodeling services. A dependable roof is pinnacle for your Glenwood home's well-being. So, if your roof experiences any issues that keep it from functioning dependably, you need to call for our roofing repair services. We work quickly to get your roof looking and functioning just like brand new so that you can enjoy the best protection for your home, guaranteed. Your bathroom is one of the central places in your life, so it wouldn't hurt to get it looking and functioning like a dream. And you can have the bathroom of your dreams by calling our experienced team for a professional bathroom remodeling. In no time at all, we can provide your Greenlawn home with a bathroom that's custom-made to your specifications. 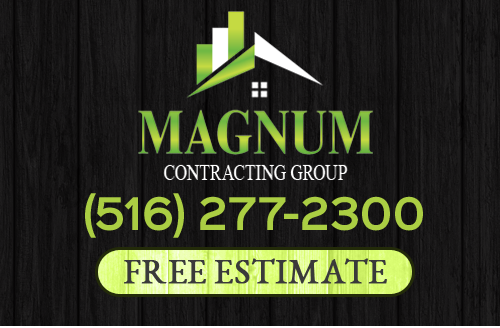 If you are looking for a professional Greenlawn roofing contractor or remodeling company, give Magnum Contracting Group a call today at 516-277-2300 or complete our online request form.